Backstory: I used to run competitively in high school, and my expertise was in the mile. I've only ever felt proud of myself once or twice; to put that into perspective, I've won my fair share of races, probably over 25, but I'm not sure as it wasn't that important to me for most of the races. Knowing you've done all that you can is the most amazing feeling you will ever have a change to feel, and I would doubt that most people will ever feel anything like that; its what some people would describe as a religious experience, and for Ayrton on the day he finally won the Brazilian Gran Prix, it was. And before you go off assuming you know what it's like ("oh, a runners high?" NO! ), I would beg you to look into yourself and really ask before dismissing this feeling as an exaggerated sense of pride. It's not something I felt even after I won and was exhausted beyond belief; something else needed to be in the mix, but I'm not sure I could tell you what that was. To me, the part of the scene that hits home is not when he is in the McLaren driving with only one gear, but when he is on the podium in absolutely more pain than would be bearable to anyone without that level of adrenaline and sheer will. 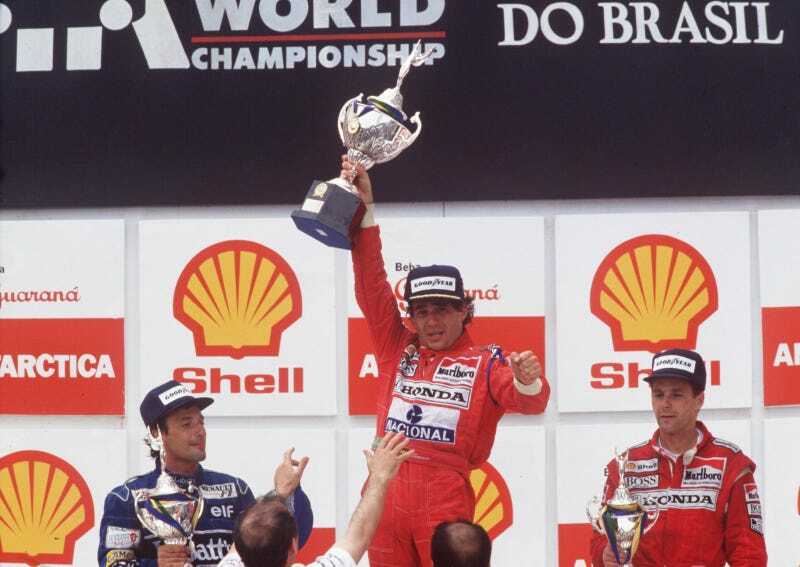 Ayrton lifts the trophy for himself, for his family, for God, for Brazil. He could have just stood there with his eyes closed and whimpered a fake smile before retiring to the medical doctor. He would have still won, he would have still had the respect of his country. I could feel the pain in his eyes, looking at me, glassed over thought the movie screen. There was so much pain in his eyes; there was so much happiness. To give everything you have, and then to find a little piece of something else and decide to give that up too, knowing well enough that you already have the praise of everyone around you, is indescribable. I felt a few salty drips run into my mouth and tried to hide my reaction from everyone else in the movie theater, but I'll never be ashamed of crying during that moment.